This is my first attempt at making shortbread cookies. I searched the wonderful world of Pinterest until I stumbled upon one I wanted to try. My baking cabinets was limited but I did manage to have enough to whip these babies up including an unopened tub of chocolate hazelnut frosting. Score for me! 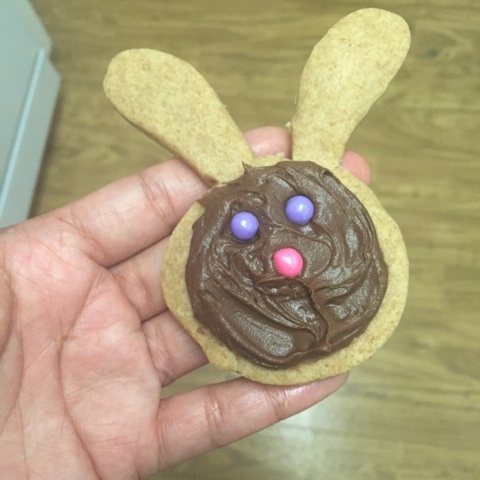 I rolled the dough out and used my super cute Easter cookie cutters. The dough is soft and crumbly. Add extra flour if needed. 1. Mix together softened butter, powdered sugar, and vanilla. It will be nice and creamy. 2. Slowly pour in flour and mix with wet ingredients. Chill dough for 20-30 minutes. 3. Prep nonstick pans by spraying with Pam or other cooking spray. Preheat oven to 350 degrees. 4. When dough is chilled, form into a ball on a flour surface. Roll flat with a rolling pin and cut out shaped cookies with a cookie cutter. I used Easter eggs, flowers, bunnies, and carrot cookie cutters. Bake for 9 minutes. 5. When cookies are cool spread Phillsbury Chocolate Hazelnut frosting over the cookies and decorate with sprinkles. These cookies are simple and pretty tasty. They don't take long to make and you only need four ingredients. 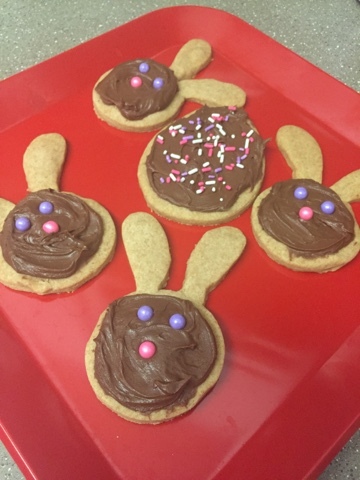 My kids and husband loved these and the bunny cookies were their favorite ones. Can you blame them? They are pretty stinking cute. Enjoy!